The patented guard design allows for greater air movement at very low noise levels. Improve air quality and working conditions by strategically placing Versa-Kool circulation fans throughout the work area. Great for tent rentals, special events, sporting events, etc. Totally enclosed heavy-duty motor, thermally protected, pre-lubricated ball bearings. Maintenance free motor. Patented safe non-restrictive fan guards. Aluminum fan blade. Pole mount included. 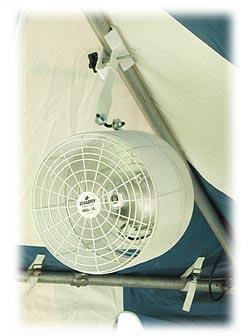 * Please call us for any questions on our 12 inch tent fan in Tyler, serving Longview, Palestine, Athens, White Oak, Shreveport LA in East Texas and Western Louisiana.